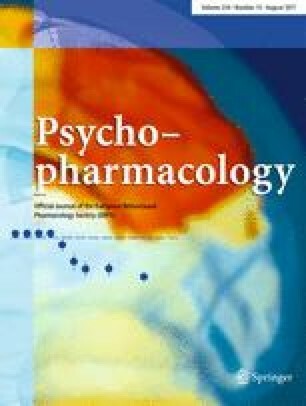 The intent of the present study was to determine the effects of systemic injections of the sympathomimetic agent ephedrine (EPH) on extracellular dopamine (DA) levels within the rat nucleus accumbens (NAC) and to compare these effects with those of EPH on locomotion and on feeding. In experiment 1, adult male rats were prepared with an indwelling 3 mm microdialysis probe positioned within the NAC. The rats were injected (IP) with vehicle, 5, 10, or 20 mg/kg (–)-EPH with dialysates collected every 20 min for 100 min after drug injection. Systemic injections of 5, 10 or 20 mg/kg (–)-EPH significantly enhanced extracellular levels of NAC DA over baseline by 79%, 130%, and 400%. Systemic injection of 20 mg/kg EPH significantly reduced NAC levels of DOPAC and HVA by 37% and 31%. The effects of EPH on brain dopamine activity were stereospecific given that an additional group of rats injected with 20 mg/kg (+)-EPH exhibited smaller changes in NAC DA (<25%), DOPAC (<10%), and HVA levels (<20%) than did rats injected with 20 mg/kg (–)-EPH. In experiment 2, adult male rats were injected (IP) with 0, 5, 10, or 20 mg/kg (–)-EPH prior to placement in automated activity chambers. Total distance traveled was significantly increased by 10 and 20 mg/kg (–)-EPH, but not by 5 mg/kg (–)-EPH. In experiment 3, adult male rats were injected (IP) with 0, 2.5, 5, or 10 mg/kg (–)-EPH or with 0, 2.5, 5, or 10 mg/kg (+)-EPH prior to a 30-min feeding test. Although each EPH enantiomer decreased feeding, (–)-EPH was more potent in feeding suppression than was (+)-EPH. The present results suggest that EPH may alter locomotion and feeding via an indirect action on brain dopamine activity.